Dark Night is out on DVD on November 13th and to celebrate we have a great competition for you and 3 copies on DVD to give away. 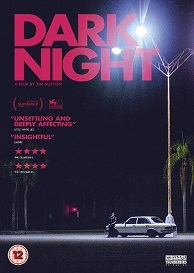 Based on harrowing real events, DARK NIGHT tells an increasingly common story of violence in contemporary America, where a suburban landscape plays witness to the inevitable, unfolding evens that culminate in a Cineplex massacre. Over the course of one day, from sunrise to midnight, six strangers - the shooter among them - share in the new American nightmare. 4. Only entries that have come directly from people visiting this page will count. If you see this competition advertised anywhere else please report to me, all entries from other sites will not count. 5. The question is regularly changed to prevent cheating. 6. Winners will be chosen randomly and will be informed via email. Interview with Martin Gooch - "The Gatehouse"